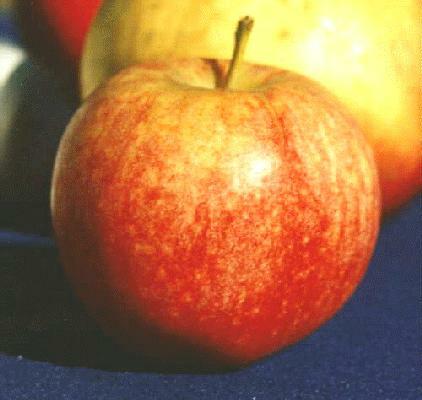 Gala originated in New Zealand as a three-way cross of Red Delicious, Golden Delicious, and Cox Orange Pippen. Small to medium size yellow apple with scarlet stripes. A number of redder sports have been developed, such as "Royal". Sweet, aromatic apple with totally unique wonderful taste. Not tart. Excellent for fresh eating, and cooking. Ripens in early September in the Willamette Valley. Not a particularly good keeper.